Welcome to The Abalone! This newly constructed 8 bedroom/6 bathroom luxury villa is a combination of two units: Casa Eulimia & Casa Junonia. Each unit features a 4 bedroom/3 bathroom configuration, each with their own common space, kitchen, outdoor patios & private heated outdoor pool. 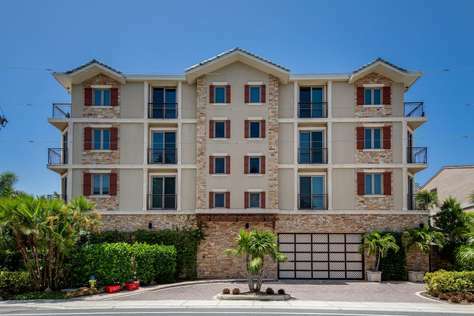 With modern and coastal decor throughout, you will truly be living “the beach life.” The Abalone is located just steps from Point of Rocks Beach & minutes from Siesta Key Beach, voted the # 1 beach in the USA! This home is ideal for large families & groups. Welcome to The Big Kahuna! Our newly constructed luxury cottage (completion date of June 2017) has all the amenities your large group [up to 24!!!] can fathom. It also boasts the very BEST location, in the heart of Siesta Key Village, just behind Gilligan's and Lelu's Coffee Shop! Inside you’ll enjoy contemporary porcelain wood style flooring throughout the entire three-story building, an elevator to access each landing from the ground floor, gorgeous and decadent over-sized bathrooms, new appliances, washers/dryers, quartz counters and state of the art stainless steel appliances in the kitchen, and four verandas offering breathtaking views of your very own two private pools among many other great amenities. Downstairs, enjoy your very own private cabana pool side that boast lounging for your group as well as a outdoor refrigerator, barbecue grill, and a HDTV wall mounted TV for your favorite sports! The over-sized garage comes complete with bicycles, beach chairs, a cooler, and beach caddy so that your three minute walk to our pristine beach is truly effortless. 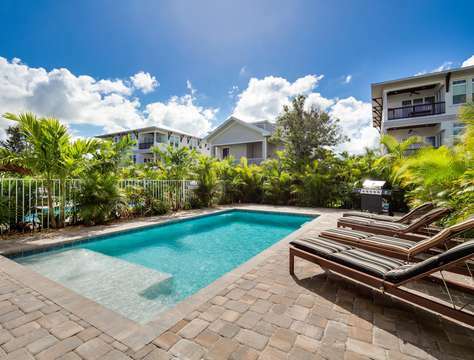 The Big Kahuna is the configuration of two homes (Casa Ohana and Casa Mahalo) combined, each having 4 bedrooms and 3 bathrooms with their own heated pool and private cabanas in the heart of Siesta Key Village. Perfect for larger parties celebrating family reunions, weddings, special anniversaries, and more. In each home, there are 2 bedrooms with King beds and 1 Chair Sofa Sleeper (sleeping 3 in each room) and 1 bedroom with a King (sleeps 2) and 1 bedroom with a Queen (sleeps 2). Enjoy a plush and comfy Queen sofa sleeper in the living room (sleeps 2). Casa Ohana and Casa Mahalo sleeps 12 in each with maximum comfort because of their open and spacious floor-plans. Two full size laundries inside the home assure you an abundance of clean clothes and towels. Plenty of bicycles and beach equipment are available for your enjoyment and located in the garages. The Big Kahuna holds THE premier location, with close proximity to Siesta Key’s the #1 Beach in America and in the heart of the famous Siesta Key Village, just behind Lelu's and Gilligan's right along many other restaurants, shopping, entertainment and Nightlife. Welcome to The Conch! Our newest luxury cottage has all the amenities your large group [up to 24!!!] can fathom. Inside you’ll enjoy contemporary porcelain wood style flooring throughout the entire three-story building, an elevator to access each landing from the ground floor, gorgeous and decadent over-sized bathrooms, new appliances, washers/dryers, quartz counters and state of the art stainless steel appliances in the kitchen, and four verandas offering breathtaking views of your very own two private pools and Point of Rocks road among many great amenities. Downstairs, enjoy your very own private cabana pool side that boast lounging for your group as well as a outdoor refrigerator, barbecue grill, and a HDTV wall mounted TV for your favorite sports! The over-sized garage comes complete with bicycles, beach chairs, a cooler and beach caddy so that your three minute walk to our pristine beach is truly effortless. The Conch is the configuration of two homes (Casa Coquina and Casa Antilles) combined: Casa Coquina sleeps 14 and Casa Antilles sleeps 12 with maximum comfort because of their open and spacious floor-plans. This luxurious 8 bedroom/six bathroom home is a unique combination of two units: “Casa Stolida” and “Casa Tegula” (4000 sq. ft. total). Each unit features a 4 bedroom/3 bathroom configuration, each with their own cabana room, separate living areas, private elevators and your very own private heated pools! Once inside, you will see that The Nautilus is the definition of Siesta Key living. With coastal décor and brand-new furnishings throughout; you will truly feel like a Siesta Key local! The Nautilus is ideal for families and large groups. Welcome to The Seascape! The Seascape is the combination of two massive beach front condos located right on Siesta Beach in a newly constructed building. With amazing views, a heated pool, and enough room to sleep up to 16, it is the only way to experience Siesta Key. The Seascape is the unique combination of two side-by-side condos that are aptly named "West Shore" and "Ocean's Edge." 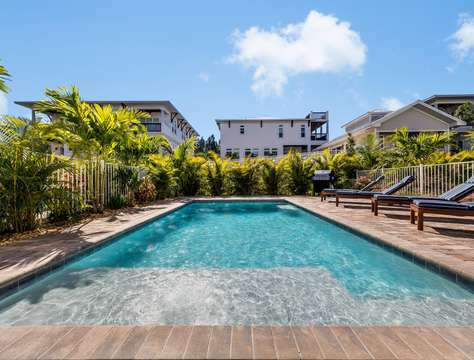 Essentially by renting both units combined, you claim your very own floor of this extremely private and exquisitely well designed condominium complex of only 6 units altogether. Unlike most condominium complexes with hundreds of units sharing one communal pool, you will have the elite status of sharing a private heated pool with only 4 other possible residents at any given time. The Seascape not only has the best panoramic views of all of Siesta Beach, but it also features a decadent interior with spacious living areas, open and and inviting with endless views from the kitchens, and living areas. The 8 bedrooms are tucked privately away, each exuding the style of master suites featuring private bathrooms and king beds (sleeps 2 in each master room). There are 8 full bathrooms and two half baths making it ideal for large groups to prepare for a night out! The home comfortably sleeps 16 with plush bedding, soft towels, and an abundance of wonderful amenities at your disposal. The Seascape also has two of the finest kitchens that even a professional chef would enjoy! Fully stocked, and ready to accommodate a large gathering, the chef can partake in the festivities of the party thanks to the open and spacious floorplan, all the while guests can belly up to the kitchen bar for great conversation and libations! Top of the line stainless steel appliances, granite counters, and gorgeous and spacious cabinets reminds you that this home is nothing short of luxurious. When it's time to explore the island, why not head down to Siesta Key Village... only just a few moments away. The walk to the village is just as easy... ! It's just around the corner, and you can be there in less than 10 minutes. Also try out our free trolley service that runs from north and south on Siesta and discover all of our many beaches, the south end village, and even the bay and marina on the island! And when you've decided it's time to head back from a long day at the beach, plan your evening in by hopping in the heated swimming pool and then head upstairs to treat the family to the perfect dinner al fresco on the spacious verandas with your own gas grill and a massive dining room table that seats 12 in each unit! If that's not enough, there is also an interior dining room table that also seats 12 in each unit. Siesta Key Village offers the best dining and entertainment, and you're just moments away from all that makes Siesta Key fabulous! The location is perfect! The beach, the village, the views.... none of which can be beat! Welcome to your next forever vacation home, The Seascape!